Learn aspects of the disaster cycle (hazards, response, recovery, mitigation, and preparedness); speakers share about emergency services, FEMA, Salvation Army, NVOAD, helping socially vulnerable people, etc. Learn about the history of Mennonite Disaster Service (MDS) and all aspects of the work of MDS. Learn construction terminology and gain knowledge of the construction process in doing hands-on building. Learn the basics of first aid and CPR before going to the Summer Field Experience site. Service Days: Serve at places like Interfaith Housing Services, Camp Mennoscah, the Mennonite Central Committee warehouse, Habitat for Humanity house, etc. At least three service opportunities required per semester. Most of these are on Saturdays. Team Building Day at Prairie View: Join with the second-year students in taking part in activities that encourage communication, cooperation, and team building. MDS Leadership Training Workshop: Leaders from MDS come to campus to train people interested in serving with MDS in a two-day workshop. Students attend and participate in part of this training. This occurs every other year. Summer Field Experience: Learn all phases of the MDS project experience while working on an active MDS site for eight weeks. These experiences include: construction work, office managing, cooking, crew leading, engaging in the spiritual life of the site, interacting with volunteers, interacting with homeowners, learning about project directing and interagency work. This is a three-hour class. Learn about management functions of planning, organizing, leading and controlling, in order to meet organizational strategic goals. Students will explore their own management and leadership skills and styles. 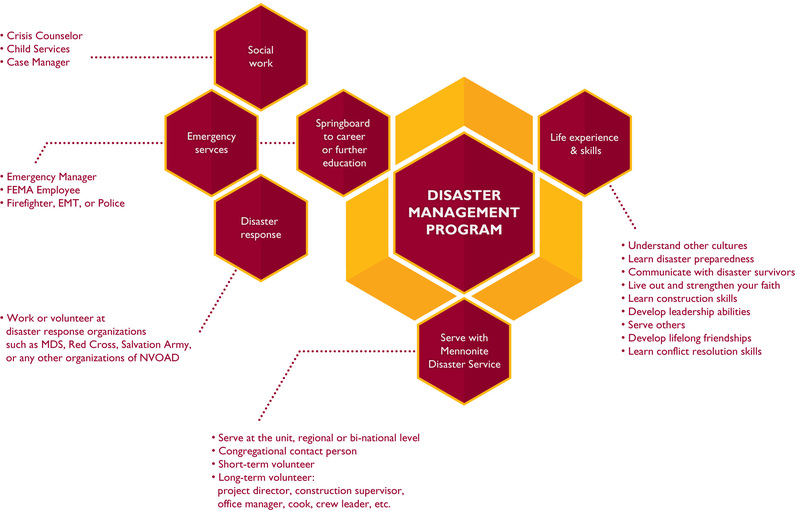 Apply knowledge gained in previous courses and Summer Field Experience in studying case studies in disaster response and recovery. Attend the MDS All-Unit Meeting and reflect on it, complete a project for MDS or the DMP, and reflect on the DMP experience. Sharing at HC Chapel: Reflect on the Summer Field Experience at a Hesston College chapel service in September. Team Building Day at Prairie View: Join with the first-year students in taking part in activities that encourage communication, cooperation, and team building. Summer Internship: Serve with MDS or with another disaster response or recovery organization for eight weeks. This is a good opportunity for students to practice leadership skills and to use this experience as a bridge to the next steps in their lives. This is not a class, but required for scholarship acceptance. This may be completed any time within a year of graduation from Hesston College.